Ultrasound is a non-invasive imaging study that uses high frequency sound waves instead of X-rays or radiation to produce diagnostic images of body parts and internal organs. Ultrasound is an extremely useful imaging test to help physicians diagnose a wide range of medical conditions. It is fast and painless, and no injections are used. 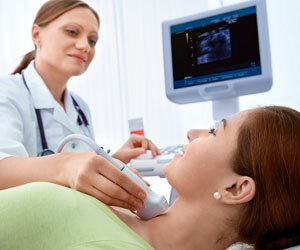 Ultrasound can be useful in determining the source of a patient's pain, swelling or infection. It is helpful in demonstrating movement, function and anatomy and assessing damage after an illness or injury. It allows radiologists to observe the patient's blood flow in real time. Ultrasound has also been proven to be a good method of guiding minimally invasive procedures (please see Ultrasound-Guided Biopsies). During the ultrasound exam, a water-soluble "gel" is applied onto the skin and a transducer or probe is slowly moved over the area of the body that will be examined. Harmless sound waves pass through the area of interest and ultrasound images will appear on a monitor similar to a TV screen.